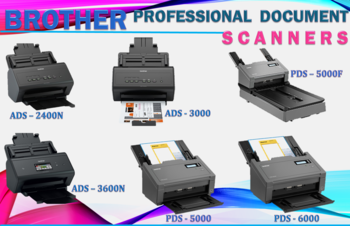 MOBILE SCANNERS Brother portable scanners are the perfect choice for small businesses, mobile professionals or anyone else who needs a compact mobile scanner loaded with high performance features. Scan photos, business cards, invoices, statements, receipts, contracts, forms, handwritten notes and more with these lightweight portable scanners that take up minimal space whether in a briefcase or on desktop. Brother portable scanners are powered through an included USB cable, allowing you to scan monochrome or color documents wherever you happen to be. Efficient and convenient, our portable scanners are the easy and affordable way to stay organized, reduce paper clutter and save time. ImageCenter™ DESKTOP SCANNERS The Brother ImageCenter™ desktop scanners are high-speed, reliable, high-quality and easy-to-use. They are the perfect choice for businesses and workgroups looking to scan to various destinations such as a E-Mail, OCR, file, image, USB flash memory drive† and Android™ tablet/mobile device†. Additionally the ADS-2500W network model supports scan to E-Mail server, FTP, network and web (cloud) applications†. Take a moment to think about those multiple-step scanning operations that are done again and again, day after day. Scanning, editing, naming, choosing a file format – it’s so repetitive. Now imagine the time and money you could save by doing all that at the press of a button. That’s what the Brother ImageCenter™ ADS desktop scanner series is all about. The ImageCenter™ scanners with built-in, easy-to-use functionality let you capture, manage, process, and deliver PDFs and other file formats - automating processes that previously were time-consuming. The Brother ImageCenter™ desktop scanners are ideal for busy workgroups looking to maximize productivity and streamline scanning applications that were previously in printed form. To learn more about portable and desktop scanners and how they can help you, click through the categories above. If you have any questions or would like more information about a particular product, feel free to visit our Support Center or contact us.